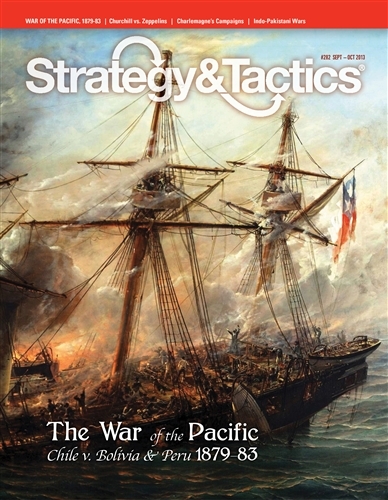 Also arriving last Friday in Singapore and adding to my reading list pile was issue #282 of Strategy and Tactics magazine. The issue with this issue for me is the main article concerns the War of the Pacific (Guerra del Pacífico). War of the Pacific was a war fought between Chile on the one side and Bolivia and Peru on the other over a piece of desert rich with one of the key ingredients to gunpowder. Bolivia lost its access to the sea as a result of this war. I have some ships in 1/2400th on my painting queue for this war as well as some 10mm figures from Pendraken Miniatures. I also discussed a brief history of this conflict in The War of the Pacific – 1879 to 1883 – Naval Matters and War of the Pacific – 1879 to 1883. Why is this an issue? It is tempting to put everything aside tonight and start painting these little beasties – sigh, another bright shiny object. Another good issue and recommended.